Sometimes all that is discovered of a Santana pterosaur specimen is a big elongated wing. From past experience we know that two clades filled prehistoric Santana skies, members of the Ornithocheiridae close to Anhanguera, and members of the Tapejaridae close to Tupuxuara and Tapejara. Now Vila Nova and Sayão (2012) have cleared things up. Their new paper plots wing dimensions for both clades, recovering two separate clouds of data. That means wings without skulls can now be identified by dropping their data into the graph and seeing which cloud it nests in. Figure 1. The two clouds of data. Above, the Anhangueridae. Below the Tapejaridae. The Vila Vova and Sayao (2012) report highlights an important aspect to evolution. There is no modular evolution as discussed earlier. When a taxon evolves it does so from head to tail, sometimes unevenly, but this report on distinct wing finger proportions is directly in line with earlier reports of distinct free finger and feet proportions (Peters 2011). Vila Nova BC and Sayão JM 2012. 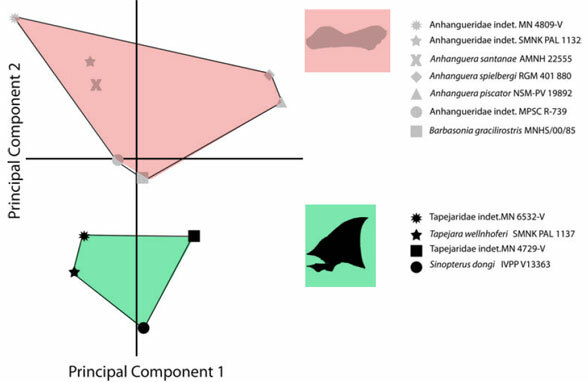 On wing disparity and morphological variation of the Santana Group pterosaurs, Historical Biology: An International Journal of Paleobiology. Binocular vision in certain birds is well known (Fig. 1). You can read more about it online here. Most birds have eyes on the sides of their heads. Apparently most have some degree of binocular vision. However, owls are different, with eyes rotated to the front for the skull. This occurs largely by the increased width of the back of the skull. The beak was always narrow, so narrowing of the beak was never an issue. Eagles and hawks have more binocular vision than most birds, other than owls. Figure 1. An old image, perhaps from the 50-year-old Time/Life series, illustrating bird vision in a sparrow, a woodcock and an owl. The overlapping dark orange areas represent binocular vision. Most birds are like the sparrow, but many have some degree of binocular vision. Binocular vision in pterosaurs is a largely untouched subject. Most pterosaurs did not have much binocular vision. With eyes on the sides of its head, Pteranodon (Fig. 2) is such an example. It could view its entire world, but had to tilt its head one way or the other to see straight ahead. Many birds are similar. Figure 2. The skull of Pteranodon in dorsal view without the possibility of binocular vision. Basal anurognathids, like Dendrorhynchoides (Fig. 3) also had eyes on the sides of their head, but note the slightly greater width at the back of the skull. Anurognathids evolved from a sister to Dimorphodon, Preondactylus and several other dimorphodontoids, including the IVPP embryo, all with small eyes at the back of their skull and little to no binocular vision. Perhaps binocular vision has been ignored by pterosaur workers largely because no others have bothered to accurately reconstruct the skulls of the only pterosaurs with substantial binocular vision, the owl-like anurognathids. Figure 3. 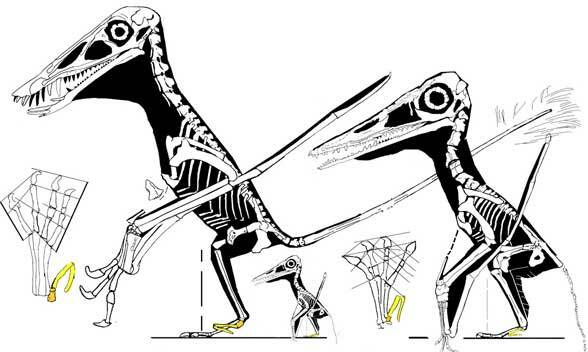 Dorsal and lateral views of three anurognathid pterosaurs. From left to right, Dendrorhynchoides, Batrachognathus and Jeholopterus, all crushed dorsoventrally, due to the skull’s greater width. The frontals were expanded laterally behind the very large eyeballs of Batrachognathus. The large upper temporal openings were likely filled with large muscles, larger than those of other anurognathids. The rostrum was shorter than in Dendrorhynchoides. Of all the known pterosaurs, Batrachognathus was the most owl-like. The scerlotic ring filled the orbit, which probably restricted the movements of the eye within the orbit. The skull had to be rotated to change the view. The large eyes also may indicate a nocturnal lifestyle. The other derived anurognathid is Jeholopterus, the vampire pterosaur (Fig. 3). It had smaller eyes and a smaller pair of frontals, but they were angled like those of Batrachognathus. Considering the large size of the orbit and the small size of the eyeball itself (as revealed by the small sclerotic ring) one can imagine that such an eyeball had a greater ability to rotate within the skull, looking both sideways and somewhat forwards. Once latched onto its prey, there was no longer any need to look forwards, only to watch out for fellow vampires coming in from above to feast alongside it. The CAGS specimen had little to no binocular vision despite its closer relations with the above two anurognathids. A relatively broad set of nasals and relatively small upper temporal fenestra provided excellent vision to each side, but not much up front. As always, I encourage readers to see specimens, make observations and come to your own conclusions. Test. Test. And test again. Pterosaur workers, don’t be afraid to attempt your own reconstructions of anurognathid skulls. The bones are all there. I’ve provided guides to several specimens, but make your own observations. Don’t blindly follow the autapomorphic monstrosity of Bennett (2007). Test it with your own tracings and share your results. There are no published studies of binocular vision in pterosaurs. If you know of some, let me know. While we know of bipedal and quadrupedal pterosaur tracks left in soft mud and sand, we will never have traces of pterosaurs clinging to trees. Nevertheless, certain pterosaurs have provided clues that they did so, or could have done so, while others could not. Figure 1. From left to right the pterosaurs MPUM 6009, Dorygnathus, Pterodaustro and Nyctosaurus, all to the same relative metacarpus length demonstrating the relative size of the free fingers. Those with larger free fingers were more adapted to cling to trees. Tree clinging goes back to Longisquama, Cosesaurus and perhaps even Huehuecuetzpalli and Lacertulus, basal tritosaur lizards that had tendril-like hind toes, like a modern Iguana. Unlike Iguana, Huehuecuetzpalli and Lacertulus had relatively smaller hands, fingers and finger claws. A quick look at the modern glider, Draco, can be instructive on this point. Giant claws may not be necessary, but long tendril-like fingers seem to help. The pterosaur ancestor Longisquama had relatively enormous fingers tipped with trenchant claws and a bipedal body plan. So it clung to trees in a different fashion than a typical lizard — and more like a telephone lineman (or a lemur) with feet planted beneath the hips, the belly elevated off the trunk, the arms extended and the fingers wrapped around the trunk, claws dug in. Finger 4 was rotated axially and posteriorly at the carpus. Despite its great length, finger 4 was no longer involved with tree clinging, as demonstrated by the discontinuous PILs (described here). Early pterosaurs, like MPUM 6009 (Fig. 1) and Dorygnathus (Fig. 1) had relatively long fingers tipped with trenchant, bark-stabbing claws. Primitively their metacarpals and fingers increased in length from 1 to 4. In Dorygnathus metacarpal 2 and 3 were subequal. In certain later pterosaurs the metacarpals would appear in different proportions. 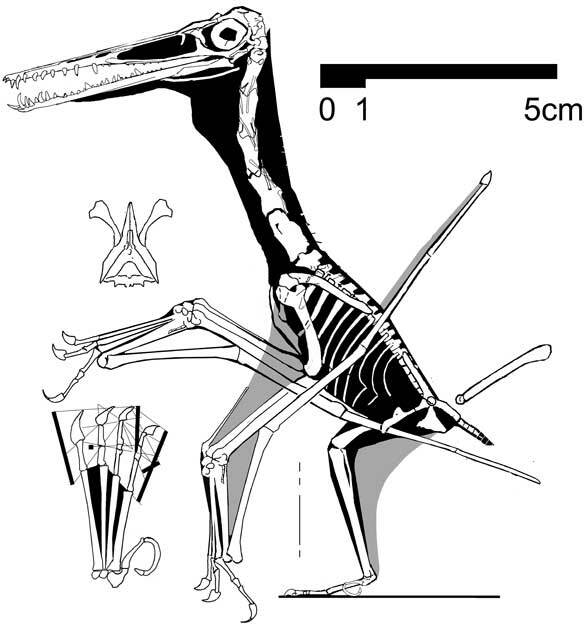 Pterodaustro (Fig. 1) had relatively tiny fingers on metacarpals in which mc 1 was longer than mc2, which was longer than mc3. Digit 2 was subequal to 3 and no manual ungual was deeper than its penultimate phalanx. A series of Nyctosaurus specimens demonstrate the reduction of all three fingers in that genus, culminating in the UNSM93000 specimen which had useless wire-like vestiges. In the present supposedly “heretical” configuration the forearm was unable to pronate or supinate, thus the palmar side of the fingers faced ventrally in flight and medially with wings folded (Peters 2002). This controversy was blogged about earlier. The key here is the palmar sides of the fingers facing medially with wings folded so pterosaurs could grapple parasagittal tree trunks between their opposing hands, much like the early bird, Archaeopteryx, which had similarly elongated fingers and a forearm similarly unable to pronate and supinate. Other scientists proposed finger configurations that were permanently supinated (i.e. Bennett 2008), but these did not allow tree clinging. Azhdarchids, even large ones, had robust fingers with deep claws. Were they found in trees? Or only on the ground? Jeholopterus had extremely long, curved hand claws, built like surgeon’s needles. These look to be ideal for stabbing and clinging to dinosaur hide. Were these clues to its vampire lifestyle? Bennett SC 2008. Morphological evolution of the forelimb of pterosaurs: myology and function. Pp. 127–141 in E Buffetaut and DWE Hone eds., Flugsaurier: pterosaur papers in honour of Peter Wellnhofer. Zitteliana, B28. Peters D 2002. A New Model for the Evolution of the Pterosaur Wing – with a twist. – Historical Biology 15: 277–301. The news that the Chinese pterosaur, Guidraco, was most closely related to the South American Ludodactylus points to the worldwide distribution of the Ornithocheiridae, a clade of long-ranging pterosaurs. Probably not such a surprise for such wide-ranging albatross-like flyers. We also have North and South American anurognathids, Chinese Rhamphorhynchus, African dsungaripterids and South American ctenochasmatids, to name a few. We’re not coming up with anything outlandish anymore. The Guidraco news points to the virtual completeness of the pterosaur family tree. Despite its unusual and exaggerated traits, Guidraco nested well within established clades. No presently known pterosaur is an outlier taxon. All are nested. I haven’t found an oddball in the bunch. Other than the terminal taxa (those that left no descendants), all pterosaurs fit somewhere between two others. The same is true of dinosaurs and reptiles in general. Every taxon finds a sister. All enigmas are nested. The family trees are complete or virtually so. Reason to Celebrate? Depends on Your Attitude. One of the drivers of science is the search for answers and the revelation of mysteries. So what happens when virtually all of those mysteries are already solved? Does that take all the fun out? Have we already seen the Golden Age of enthusiasm and insight? Like a jigsaw puzzle that is almost done and missing just a few pieces, the present family trees indicate that future discoveries are likely to be more or less predictable ~ with new discoveries nesting between something we already are familiar with. Works With Less Than Complete Specimens too. The present trees are filled with skull only and skull-less taxa, as well as a few others of lesser quality. Even so, the data provides enough resolution to resolve long-standing mysteries and upset traditional paradigms (enabled by lack of testing better candidates). The New Trees Work Like Clockwork, But That Doesn’t Take All the Fun Out. Predictability is generally agreed to be a good trait in science, as in the Periodic Table of Elements. The new large tree provides that sort of predictability and complete resolution. The only frustration now is general adoption (hopefully by testing!!). Updated April 5, 2016 with a new image of Nemicolopterus. Basal pterosaurs had an elongate pedal digit 5, emanating from a short metatarsal 5 and composed of two hyperflexed metatarsal-length phalanges tipped by an often overlooked ungual for a total of three phalanges. Peters (2000) reported that pedal digit 5 impressed the hyperflexed dorsal surface of pedal 5.2/3 (= fused phalanges) into the matrix, as demonstrated by Rotodactylus tracks. 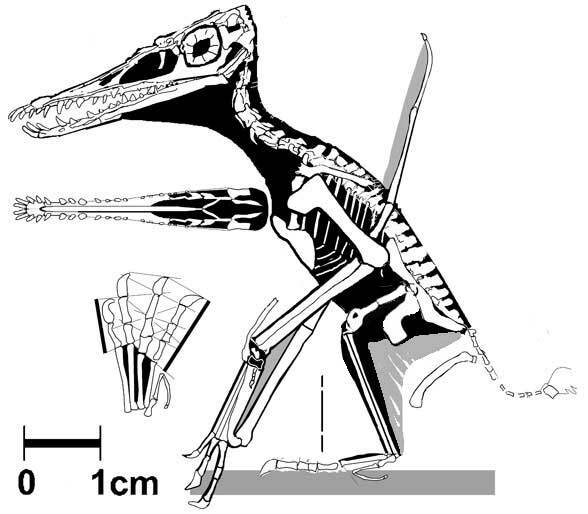 Peters (2000) attributed matched Rotodactylus to a pterosaur outgroup sister, Cosesaurus. Peters (2011) attributed similar tracks with pedal digit 5 impressing far behind the other four digitigrade impressions to anurognathids and a specific Rhamphorhynchus. Figure 1. Click to enlarge. Basal tritosaur, fenestrasaur and pterosaur feet with digit 5 bones color coded. Note the fusion of pedal 5.2 and 5.3 in pterosaurs. Find any single archosaur or set of archosaurs with a similar pedal digit 5 and you’ll have found the archosaur sister to pterosaurs. Good luck! Question for you: does the brevity of p5.3 in Cosesaurus and Longisquama mean it ultimately disappeared? Or did it fuse with p5.2? I think the latter, but the data is not quite there yet. Pterosaurs inherited that elongated toe 5 from their fenestrasaur and tritosaur ancestors, all of which (e.g. Tanystropheus) had an extra phalanx (Fig. 1). Pedal 5.2 fused to p5.3 in the most primitive known pterosaurs, so the ungual is p5.4, as in the basal lizards, Lacertulus and Huehuecuetzpalli (Fig. 1). In basal pterosaurs and Sharovipteryx, pedal 5.1 often extended to or beyond the distal end of metatarsal 4, but it does not do so in more primitive taxa. In several derived clades pedal digit 5 became reduced, sometimes to a vestige. We’ll look at those patterns of reduction today. Distinct from Lacertulus, metatarsal 5 was shorter and pedal digit 5 was longer in Huehuecuetzpalli (Fig. 1). This set up the classic pattern seen in the most members of the Tritosauria (langobardisaurs, drepanosaurs, tanystropheids and fenestrasaurs). Exceptions and reductions follow. Note: absolutely no archosaurs or archosauriformes have an elongated pedal digit 5. This trait alone should have been enough to steer workers away from the conventional and traditional “pterosaurs are archosaurs” hypothesis. Figure 2. Macrocnemus. Note the reduction of pedal digit 5. The resemblance of this skull to that of Campylognathoides (Fig. 3) is both somewhat homologous and by convergence. Several transitional taxa differ more. The first instance of pedal digit 5 reduction occurred in Macrocnemus. The entire digit was shorter than metatarsal 4 and the phalanges of digit 5 were shorter distally. A derived macrocnemid, Dinocephalosaurus, likewise had a small pedal digit 5, but it extended as far at the base of p4.2 as this reptile developed paddle-like, swimming feet. Find the missing Macrocnemus without this toe reduction and you’ll have the transitional taxon linking this genus closer to tanystropheids, langobardisaurs, drepanosaurs and fenestrasaurs. Figure 3. Campylognathoides, the earliest pterosaur genus with a reduced pedal digit 5. All known specimens had a reduced pedal digit 5. The first pterosaur with a stunted pedal digit 5 was Campylognathoides (Fig. 3). All known specimens had a stunted pedal digit 5 in which pedal 5.1 extended no further than half the length of metatarsal 4. Not sure why this is so. 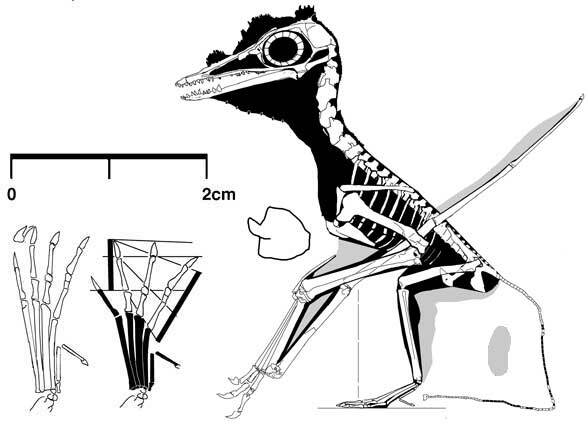 The current predecessor taxon, Eudimorphodon cromptonellus, did not have a reduced pedal digit 5, but overall E. cromptonellus was much smaller. Perhaps pedal digit 5 is the one body part that did not enlarge, phylogenetically, as the rest of the body grew larger. A taxon derived from a sister to the most derived Campylognathoides, CM 11424, Rhamphorhynchus intermedius (St/Ei 8209, No. 28 in the Wellnhofer 1975 catalog), had a longer pedal digit 5 that extended at least 3/4 of the length of metatarsal 4. So the reduction was reversed to become an elongation in Rhamphorhynchus. 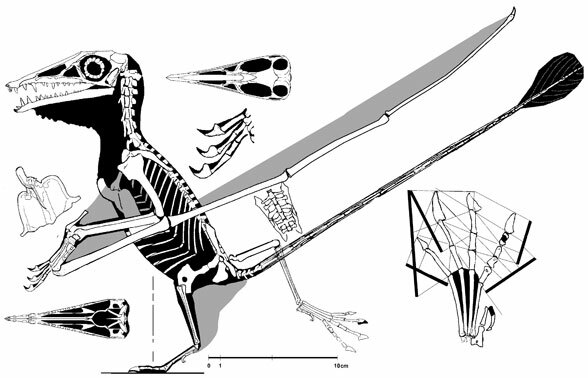 Pedal digit 5 varied in length in other Rhamphorhynchus specimens, with some extending no further than half the length of metatarsal 4 and others extending to the full length of metatarsal 4. Figure 4. Two sister taxa bridging the basal/derived pterosaur divide. TM 10341 was much smaller than the SMNS 50164 specimen of Dorygnathus (enlarged to the right). Despite the short metacarpal and long pedal digit 5, the tiny dorygnathid was considered a Pterodactylus by Wellnhofer, who listed it as No. 1 in his 1970 catalog. Pedal digit 5 no smaller relative to metatarsal 4 in the tiny sister. Typical Dorygnathus specimens, like SMNS 50164, had a very large pedal digit 5, with p5.2 bent, even so, in this taxon pedal 5.1 did not extend beyond metatarsal 4, but aligned with the line extending along mt3 and mt4. Despite the large size reduction in TM 10341 (No. 1 in the Wellnhofer 1970 catalog), pedal 5.1 extended just as far. In the larger taxon, Beipiaopterus, pedal 5.1 did not extend beyond half of metatarsal 4. It was similar in No. 44 and No. 42. Pedal 5.1 did not become smaller than half of metatarsal 4 until the base of the Azhdarchidae, represented by Jidapterus. Peters (2000a, 2011) found a correlation between the reduction of pedal digit 5 and plantigrady in these taxa. Figure 5. The MB.R. 3530.1 specimen wrongly attributed to Pterodactylus (No. 40 in the Wellnhofer 1970 catalog). Similar in fashion to the above scenario, MB.R.3530.1 (No. 40 in the Wellnhofer 1970 catalog, Fig. 5) was smaller overall and had a shorter pedal digit 5 and it became progressively shorter in more derived ctenochasmatids like Ctenochasma. In these taxa pedal digit 5 is not typically found hyperflexed, but extends its full (even though abbreviated) length alongside metatarsal 4. Relative to metatarsal 4, pedal digit 5 does not become reduced in the monophyletic clade of cycnorhamphids + ornithocheirids. However, because metatarsal 4 becomes so short in derived ornithocheirids like Anhanguera, pedal digit 5 likewise becomes small — but not relatively small. Figure 6. Pedal digit 5 in a basal Pterodactylus, AMNH 1945. In all specimens for Pterodactylus pedal 5.1 extends no further than half of metatarsal 4 (Fig. 6). Figure 7. The smallest of all adult pterosaurs, B St 1967 I 276 or No. 6 in the Wellnhofer (1970) catalog. At left is the foot plantigrade and with metatarsals slightly raised, which simplifies and aligns the PILs (parallel interphalangeal lines). The gray oval is a hypothetical egg based on the pelvic opening. The sternal complex is also shown separated from the lateral view reconstruction. The smallest of all known adult pterosaurs, B St 1967 I 276 (No. 6 in the Wellnhofer 1970 catalog, Fig. 7) extended pedal 5.1 no longer than 2/3 the length of metatarsal 4 but in larger taxa, like No. 12 and No. 23, pedal 5.1 extends to a point in line with metatarsals 3 and 4, still shorter than metatarsal 4. This pattern is also found in several other Germanodactylus specimens. Figure 8. A larger view of Nemicolopterus. Pedal digit 5 is relatively reduced here. The tiny pterosaur Nemicolopterus (IVPP-V-14377, Fig. 8) had a pedal 5.1 no longer than half the length of metatarsal 4. The larger sister, Shenzhoupterus, had a longer metatarsus and a shorter pedal digit 5. This pattern continues in Huaxiapterus with a reduction to a nub in Tupuxuara. Figure 9. Right pes, dorsal view of Pteranodon UALVP 24238. Note pedal digit 5 is a vestige on this plantigrade foot. Despite the large number of Nyctosaurus and Pteranodon specimens, few preserve toe bones (Fig. 9). Fewer still preserve digit 5 toe bones. No digit 5 toe bones are known in Nyctosaurus. A basal Pteranodon FHSM VP 2183 preserves pedal 5.1 extending no further than 1/3 the length of metatarsal 4, which is rather elongate. 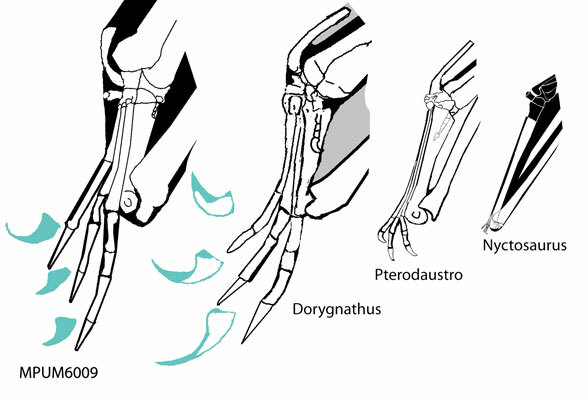 In derived Pteranodon specimens pedal digit 5 becomes much shorter, but the foot remains digitigrade. In another clade with a vestige pedal digit 5, the foot becomes plantigrade, according to PILs analysis. Pedal digit 5 is sometimes hard to find. Often it is found beneath the metatarsus. Other times it may become disarticulated and ignored or unsought by preparators, who “know” that all “pterodactyloids” lose pedal digit 5 or have vestiges at best. As you can see above and in more detail at ReptileEvolution.com, the pattern of reduction and enlargement of pedal digit 5 in pterosaurs is a little more complicated than the conventional thinking suggests. Wellnhofer P 1975a-c. Teil I. Die Rhamphorhynchoidea (Pterosauria) der Oberjura-Plattenkalke Süddeutschlands. Allgemeine Skelettmorphologie. Paleontographica A 148: 1-33.Teil II. Systematische Beschreibung. Paleontographica A 148: 132-186. Teil III. Paläokolgie und Stammesgeschichte. Palaeontographica 149: 1-30. Earlier we looked at basal pterosaur palates, dimorphodontoid palates, campylognathoid palates, pre-azhdarchid palates, pre-ctenochasmatids, pre-ornithocheirids, and pre-Pterodactylus + Germanodactylus. Here in part 8 we’ll look at the pterosaur palate from Germanodactylus to Tapejara and Pteranodon (Fig. 1), following the phylogenetic order recovered in the large pterosaur tree). Figure 1. 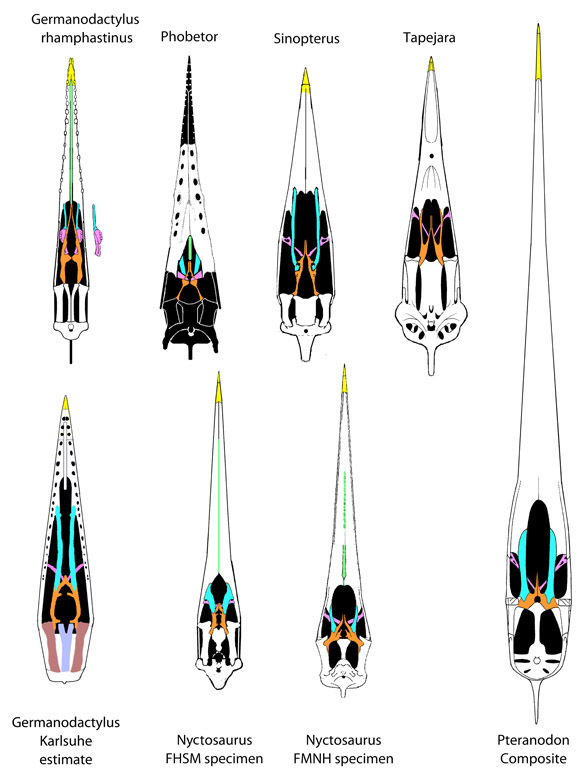 The palates of several Tapejaridae and Pteranodontidae, both evolving from Germananodactylus. Distinct from Germanodactylus rhamphastinus the skull of Phobetor/Noripterus was much sharper anteriorly. The palate was broad the teeth were partly covered by palate bone. Distinct from Phobetor, the palate of Sinopterus had no teeth, other than the single tooth at the tip (also found in dsungaripterids, but not preserved in Phobetor). The pterygoid was long and gracile. The ectopalatine was smaller, gracile and both processes were directed toward the cheek. The basipterygoids were fused to form a single broad bone. Distinct from Sinopterus, the palate of Tapejara had a post premaxilla depression (that is, deeper in ventral view). The pterygoids were shorter. The quadrates were larger. Distinct from Germanodactylus rhamphastinus the pterygoids were much longer in the Karlsruhe specimen. Both processes of the ectopalatine contacted the cheek. The rostrum teeth were merged to become one tooth. Distinct from the Karlsruhe specimen, Nyctosaurus had no teeth, more of a maxillary palate and a smaller pterygoid. In the FHSM the anterior pterygoid was expanded. In the FMNH specimen the anterior pterygoid was sharp. Distinct from Nyctosaurus, the palate of Pteranodon was larger overall and sharper. The pterygoid lateral process was much larger and the medial processes were smaller. Posteriorly the pterygoids completely filled the former space between the quadrates and the basipterygoids here fused to form a single narrow process. Both processes of the ectopalatine were fused medially, separated only near the cheek. The vomer was completely fused to the maxillary palate plates. Earlier we looked at basal pterosaur palates, dimorphodontoid palates, campylognathoid palates, pre-azhdarchid palates, pre-ctenochasmatids and pre-ornithocheirids. Here in part 7 we’ll look at the pterosaur palate from Scaphognathus to Pterodactylus longicollum (aka: Diopecephalus, Fig. 1) and to Germanodactylus rhamphastinus, following the phylogenetic order recovered in the large pterosaur tree). As previously mentioned, the pterosaur palate has been largely overlooked, unless it was specifically exposed. Figure 1. Click to enlarge. 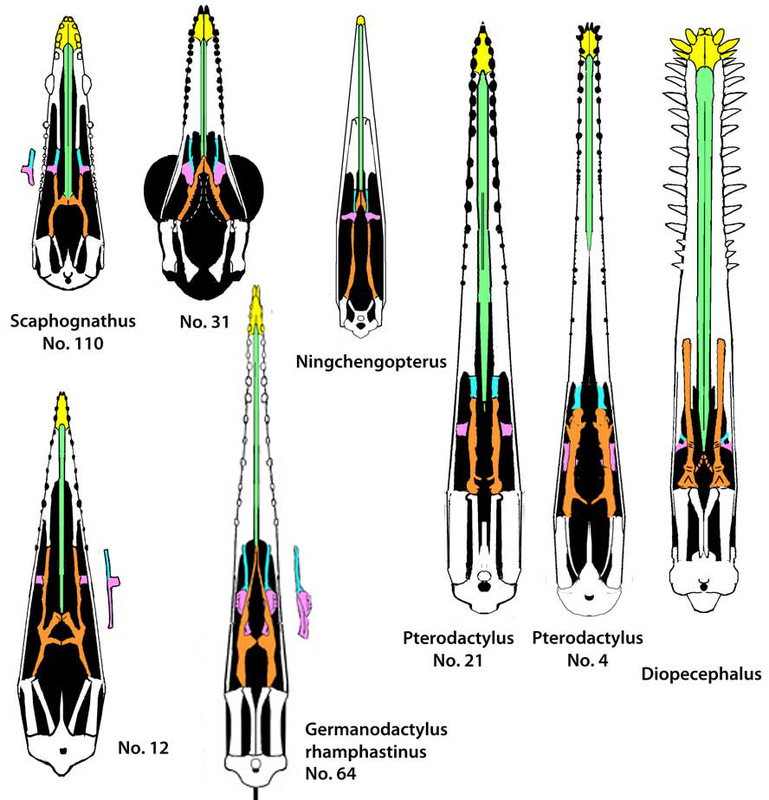 Evolution of the pterosaur palate from Scaphognathus to Pterodactylus and Germanodactylus. Distinct from the Maxburg specimen of Scaphognathus (No. 110 in the Wellnhofer 1970 catalog), No. 31 was smaller overall with a sharper premaxilla. The medial two premaxillary teeth extend anteriorly. The teeth are smaller and more homodont. The lateral process of the ectopalatine was more robust. The pterygoids were straighter. Distinct from No. 31, the palate of Ningchengopterus was longer posteriorly with more gracile elements, especially the pterygoid. Distinct from Ningchengopterus, the palate of the No. 21 specimen of Pterodactylus was longer still with a more robust vomer. The pterygoids were essentially straight and underlapping the ectopalatines. Distinct from P. scolopaciceps, the palate of the No. 4 specimen of Pterodactylus had smaller teeth and a rounder premaxilla tip. The pterygoid (still hidden beneath a thin layer of limestone) was more robust. Distinct from P. antiquus, the palate of the No. 58 specimen of Pterodactylus (Diopecephalus) had larger teeth, a broader set of vomers, a broader palate and the pterygoids extended over the maxilla (but these may be only the anterior processes of the ectopalatine). The lateral process of the ectopalatine was fenestrated. At the base of the Germanodactylia and derived from a sister to the Maxburg specimen of Scaphognathus (Fig. 1), is tiny No. 12. There is very little difference in the palate, except the medial pterygoid is bifurcated. The lateral process of the medially turned pterygoid became a new anterior process in the Maxburg specimen of Scaphognathus. In No. 12, that process is much longer, reflecting the increased length of the rostrum. Overall larger than and distinct from No. 12, the No. 64 specimen of Germanodactylus rhamphastinus has a larger maxilla palate area. The anterior medial process is longer, but the lateral process, if present, was not identified. In this clade the trend was toward a larger contribution to the palate by the maxilla and layering of the pterygoid beneath the ectopalatine. In the Pterodactylus lineage the pterygoids were parallel to each other. In the Germanodactylus lineage the pterygoids formed a triangle.